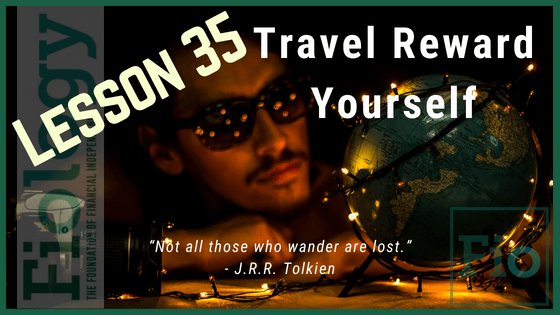 Fiology thanks Marla Taner, a travel hacking expert of the FI community, for shaping this lesson. You have developed strict financial discipline. Reward yourself by using that same financial discipline to accumulate rewards points and travel for nearly free! Most people on the path to FI (heck, most people period) look forward to a day when they can travel the world without the time constraints a traditional 9-5 imposes. Yet, when you’ve saved all that money, it’s very hard to spend it on expensive vacations and travel. You risk throwing your carefully managed budget out the window. What if I told you that all the great habits you have developed on your quest for Financial Independence can also trim the travel expense line item down to nearly zero? Travel hacking might sound dangerous and like something that might ruin your good credit rating, but for those who have been responsible with credit, you can take advantage of all the incentives banks offer for credit card sign-ups. As long as you don’t spend more than you already would, always pay your credit card balance in full each month, and you wait at least 10 months before cancelling a card, over time your credit score will actually increase. This is because your available credit and your on time payments make you an ideal customer. Many credit cards offer 50,000 point/mile sign-up bonuses – enough for two round trip domestic airline tickets. Many hotel chains also offer lucrative credit card sign-ups. If you can meet the minimum spend to earn the bonus, and apply for a few cards a year, you can quickly earn enough points and miles to travel the world for just the annual fee. If you have a spouse, these benefits can double. Watch for special increased bonuses and plan your strategy so that you earn the right points for the right trip and have fun. Do your research because earning the points is only part of it. You need to learn all the tricks to optimize your redemptions too (but we all know optimizing is another FI skill). There is lots to learn, and the world of travel rewards is constantly changing. You just might have stumbled upon a fun new hobby. Get out there and see the world – I hope to see you on your next adventure! If you currently have credit card debt, this lesson is not for you, yet. Until you have zero credit card debt and have established a discipline towards paying off your credit card statement balance in full every month, it is not advisable to begin using credit cards to support travel hacking. Note: Fiology does not receive any financial benefit by linking to the sites used in this lesson. Listen: 077 | Travel Rewards | Marla Taner choosefi.com (this is a more advanced chat about travel rewards after you’ve got the basics down). Explore: Go With Less Amy and Tim share their tips and travel adventures. Take Action: If you have determined that you are ready to begin accumulating travel rewards points, three reputable sites are Travel Miles 101, Physician on Fire, and Mad Fientist Travel Hacking Site. Each have a thorough list of articles, an option to sign up for a free course or email subscriptions to receive the latest travel hacking information, and recommended cards list. Explore: Boardingarea.com (a portal featuring dozens of travel rewards bloggers; some of the best are Loyalty Traveler, Frequent Miler and Mommy Points). Listen: 009 | Travel Rewards: How To Travel The World For Free (The Easy Way) by Brad Barrett and Jonathan Mendonsa of choosefi.com. This is an early 2017 recording and some of the specifics regarding the cards discussed have changed but you will find the discussion and techniques valuable. Explore: Award Mapper simplifies hotel award searches. Explore: Award Wallet tracks your rewards programs including frequent flyer miles, hotel, and credit card points. Explore: Credit Karma to check your credit score and research potential rewards cards. Explore: Airbnb and Trusted Housesitters Not all travel rewards have to be used at chain hotels. Some of the best slow travel involves getting to know a place like a local. Watch for Airbnb gift card discounts and referrals to save on the rates.